Cedar Vinyl Synthetic Exam Gloves; MUST CALL TO ORDER . 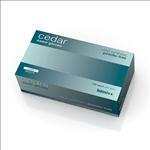 Cedar Non-Sterile Powder-Free Vinyl Exam Gloves are the safe and economical choice. � Easy to don and powder-free to minimize powder-related complications. � May be sublabeled by an equivalent or better glove.